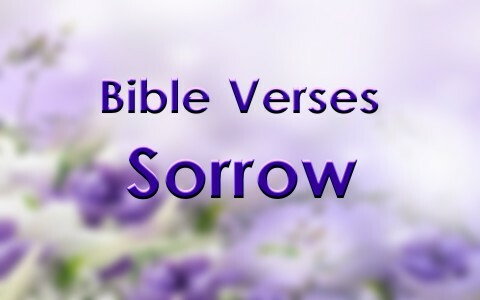 The Bible clearly recognizes that there will be times of sorrow. This can’t be avoided because of sin that is in the world. Sinful people and actions will bring sorrow on others until Jesus comes back. We can take hope that our sorrow is already known by our Father in heaven and He will help us through it. Even in our times of sorrow, we can show the grace, love, and hope of God in our words and actions. Our solid hope is in the Lord to comfort, sustain, and restore us in those days of sorrow. “For his anger lasts only a moment, but his favor lasts a lifetime; weeping may stay for the night, but rejoicing comes in the morning” (Psalm 30:5). Sorrow has a start and stop time as the Lord doesn’t keep His people in a constant state of weeping. He fills us with the Holy Spirit who translates our moans and groans into prayers to heaven. Our Lord also gives us peace to endure through the difficult days so that we can make it through. Many tears run through the darkness of pain; however, through the light of Christ we can take joy in the midst of it. “It is better to go to a house of mourning than to go to a house of feasting, for death is the destiny of everyone; the living should take this to heart” (Ecclesiastes 7:2). When we comfort those who are going through sorrowful times, we are reminded of the brevity of life and the promise of heaven. These moments help us realign our lives with God’s will and purpose for our lives. We waste less time on the fruitless pursuits of worldliness and charge forward towards holiness and righteousness. The house of mourning sets in place the reality of that we are ambassadors for Christ and this world isn’t our home. “Blessed are those who mourn, for they will be comforted” (Matthew 5:4). Some mourn because of the regrets from sinful ways and others mourn because of the sinful acts of others against them. Knowing Christ makes the difference as He has sent the Comforter to those who place their trust in Him. We are comforted even when we are stricken with grief as the Lord brings peace that passes all understanding through the Holy Spirit. In sorrowful days we may not feel blessed at that time—yet we will know His comforting hand over our hurting souls. “You turned my wailing into dancing; you removed my sackcloth and clothed me with joy, that my heart may sing your praises and not be silent. Lord my God, I will praise you forever” (Psalm 30:11). Many people get lost in their sorrow so that it encompasses their whole lives. Yet for those who put their hope in Christ, even in seasons of sorrow—the Lord’s faithfulness is demonstrated with a believer’s renewed joy in the spirit. For those who know Christ there will be days of rejoicing again because the joy of the Lord is our strength. “My soul is weary with sorrow; strengthen me according to your word” (Psalm 119:28). Over a period of time, sorrow can wear a believer down. It’s important to keep a close focus and attention on God’s word. By reading or meditating on Scripture during the sorrowful days, God gives us strength to push forward. God uses His word to bring the necessary healing we need on a daily basis. It’s our responsibility to make the Bible a centralized part of our lives every day even when it’s difficult. “Godly sorrow brings repentance that leads to salvation and leaves no regret, but worldly sorrow brings death. (2 Corinthians 7:10). There are distinct differences between godly and worldly sorrow. As demonstrated by Peter who was sorrowful, but returned to the disciples in contrast to Judas who was sorrowful, but committed suicide. Godly sorrow brings us to our knees in complete surrender to the Lord. However the worldly sorrow can only offer temporary relief at best—that will end in death eventually. In Revelation 21:4 we learn that in heaven, God will wipe away every tear and never will sorrow come to His people again. Yet while we are on this earth, we will suffer times of sorrow. Our solid hope is in the Lord to comfort, sustain, and restore us in those days of sorrow. Something more to read: What Does the Bible Say About Grief? Mr sally thames, don’t worry so much, meditate on the word of God. I believe God will help you. If you do not church, i suggest you find a God believing church and worship with them. Saly never give up on your sons. Our Father in Heaven never gives up on us, always awaits for us to come back to him when we are far away in spirit. I have had times of despair and sorrow with my son and within my marriage- both times I submitted them to the Lord and prayed every day for his help and guidance. He has been faithful to his promise to always be with me and we as a family have renewal where we once saw sorrow and pain. Pray every day for your sons and for yourself to be strong in the face of adversity and to find peace of spirit and mind. The journey of renewal happens one day at a time, some good, some bad, so persevere. Cyrus, start with giving everything to Christ, e.g. your marriage, your children, your work, your hopes and dreams. Be in His Word everyday. Fill your life with things that are honoring to Him, e.g. sermons from solid Biblical teachers, Christian music, a good prayer life, memorizing encouraging (or convicting), scripture a solid Biblical church, His Word. Accept the comfort that God has to offer you as He is the God of all comfort. May He bless you richly as you give Him your life, just as Jesus gave his life for you. A few months ago The Holy Spirit washed over me with such joy & peace. I suffered from depression before this experience & now months later when I have “come down” from the “high” I am dealing with a different type of drepression. I am set free & cry with joy most of the time but I am still having major problems controlling my depression. How can I be a good witness like this? Im on a deep darkness of my life now because my husband kick me and my son out his house. He wants me to be deported back to my country..but i leave all things behind there when i koved here.pls help me pray. Thank you..